WizKids has shared updated information on planned Star Trek HeroClix Away Team: The Next Generation releases announced earlier this year. 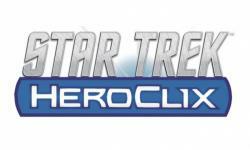 Star Trek HeroClix Away Team: The Next Generation releases were initially announced for November release (see �'The Next Generation' Beams into 'HeroClix'�). Now the Starter Set has been repackaged as a Fast Forces Pack, and the initial gravity feed/ booster release has been scaled back from 73 to 36 figures. The renamed Star Trek HeroClix Away Team: The Next Generation � Resistance is Futile Gravity Feed, along with the Fast Forces, and Dice and Token Pack will release in June 2019. A second Gravity Feed � To Boldly Go�, is planned for September 2019. The Star Trek HeroClix Away Team: The Next Generation � Fast Forces pack includes crew members of the U.S.S. Enterprise-D with all new dials: Captain Jean-Luc Picard, Commander William T. Riker, Lt. Commander Data, Lt. Worf, Dr. Beverly Crusher, and Lt. Commander Geordi La Forge. The Star Trek HeroClix Away Team: The Next Generation � Resistance is Futile Gravity Feed includes iconic characters from Star Trek: The Next Generation including Captain Jean-Luc Picard, Riker, Data, Geordi, Worf, and Deanna Troi. Adversaries will include Klingons, Borg, and Q. The release includes 36 new figures: 9 Commons (plus 1 Prime), 9 Uncommons, 9 Rares, 5 Super Rares (plus 1 Prime), and 2 Chases. Each figure is packed in a blind foil pack with hang tabs. The Star Trek HeroClix Away Team: The Next Generation � To Boldly Go� Gravity Feed will include 32 new figures. Captain Jean-Luc Picard, Riker, Data, Geordi, Worf, and Deanna Troi will be joined by adversaries the Romulans, Cardassians, Ferengi and Armus. The collection will include 8 Commons, 8 Uncommons (plus 1 Prime), 8 Rares (plus 1 Prime), 4 Super Rares, and 2 Chases. Each figure is packed in a blind foil pack with hang tabs. The Star Trek HeroClix Away Team: The Next Generation Dice and Token Pack includes two custom dice with the Starfleet icon, and six action tokens featuring images of the crew of U.S.S. Enterprise -D.